Saya akan memberikan Contoh Percakapan atau Dialog Bahasa Inggris di Hotel JW Marriott yang sangat bagus dan lengkap agar temen-temen bisa mempraktekkan bagaimana seharusnya melakukan percakapan di hotel secara baik dan benar. 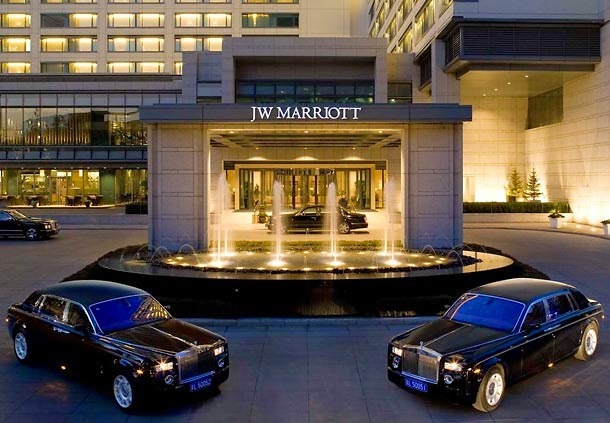 Hotel JW Marriott adalah hotel Internasional sehingga penggunaan bahasa inggris di sini harus baik dan sempurna. Tapi jangan kawatir karena contoh percakapan bahasa inggris yang saya sajikan ini betul-betul terbaik. Jika kita bekerja di hotel, maka kita harus bisa melakukan percakapan yang sempurna dan sekaligus bisa memenuhi kebutuhan kita sebagai pihak hotel yang harus memberikan informasi dan pelayanan yang terbaik buat pelanggan atau tamu hotel. Dan berikut ini adalah contoh percakapan / dialog bahasa inggris di hotel yang telah kami siapkan untuk temen-temen semua. Kami harap contoh percakapan bahasa inggris ini dapat membantu anda yang berkerja sebagai resepsionis di hotel. Receptionist : Good morning, Welcome to the JW Marriott Hotel Medan. What can i do for you? Mr. Kamil : Good morning, my name is Januar Kamil. I have a reservation for a single room for five nights. Receptionist : Alright, Mr. Kamil. Let me pull up your reservation. (Checking Mr. Kamil’s Reservation in the Computer) I can’t seem to find a record of your booking mr. Kamil. Did you book the room directly through us or did you use a hotel reservation service or travel agent? Mr. Kamil : Well, I booked it directly through you. I have already paid a deposit on the first night.I have a reservation number if that helps. Receptionist : Yes, sure. Would you mind if I see it, please? Mr. Kamil : Oh! That sounds nice. But how much more is that cost? Mr. Kamil : What about the wireless internet? Receptionist : Oh, it is really easy to use. This is your access code and instructions on how to use wireless internet. If you have any problems feel free to call the front desk. And this is a list of all our amenities like the gym, sauna and the indoor pool. Receptionist : You’re welcome. Has the valet taken your car or will you need a parking pass? Mr. Kamil : Oh. My friend took me here. I don’t have a car. Receptionist : Alright, Could I have some form of your ID please? And could you mind to fill out this registration sheet? Mr. Kamil : Sure, here’s my KTP. Receptionist : Thank you, oh, you’re from Makassar. Mr. Kamil : Yes, I am. I have been living for many years. Mr. Kamil : Yes I did, thank you. The flight was really long but it was smooth and I slept almost the whole day. Receptionist : And is this your first time in Medan? Mr. Kamil : Yes, it is. I have a business conference to attend, but I am looking forward to getting some sightseeing done as well. Receptionist : Well, I’d be more than happy to give you some sightseeing tips if you need any. Receptionist : Alright. I’ve got you all checked in to your room. This is your room key. You are in room number 554. Just take the elevator on my left up to 5th floor. When yo get off the elevator. Your room is at the end of the corridor on the right-hand side. Just leave your suitcase here and let our bellboy bring it up. Mr. Kamil : Great. Thank you very much. Receptionist : If you need anything please free to dial the front desk. Please enjoy your staying.